LeafGuard by Midlands Home Solutions installs rigid foam insulation for a variety of applications, including the attic, basement and crawl space. If you're interested in upgrading your house with rigid foam insulation, call us at 1-844-807-6136 or click the link below to request a consultation and estimate! We are the home insulation experts in Omaha, Lincoln, Council Bluffs and surrounding areas. Rigid foam insulation provides high insulating value with little thickness, but not all rigid foam performs the same. The experts at LeafGuard by Midlands Home Solutions can help you choose the best rigid foam for the area of your house that needs insulating. As a Dr. Energy Saver dealer, LeafGuard by Midlands Home Solutions has exclusive access to this innovative foam insulation product, as well as many other quality insulation materials. We would be happy to discuss which rigid foam insulation product would be the best solution for your home. Schedule a custom home energy audit to get a better picture of your home's energy problems or simply request an estimate to upgrade your insulation. 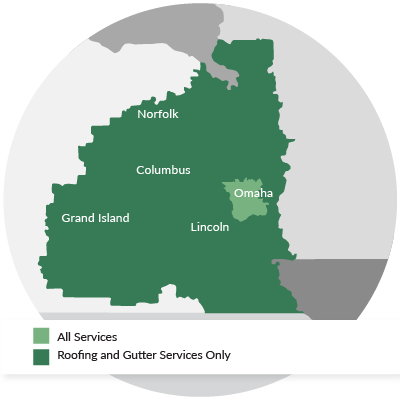 We provide complete energy-efficiency improvements and insulation services in Omaha, Lincoln, Council Bluffs, Sioux City, Bellevue, Grand Island, Kearney, Fremont, Hastings, La Vista and many nearby areas.